Canada’s Valeant Pharmaceuticals posted a 9.9% decline in its fourth quarter 2017 revenue, driven by the impact of divestitures and lower volumes in the U.S. Diversified Products segment. Revenue declined to $2.16 billion from $2.4 billion in the second quarter of 2016. The company swung to profit in the quarter compared to a loss a year ago, helped by increase in the benefit from income taxes. Net income attributable to Valeant was $513 million compared to a loss of $515 million in the same period in 2016. 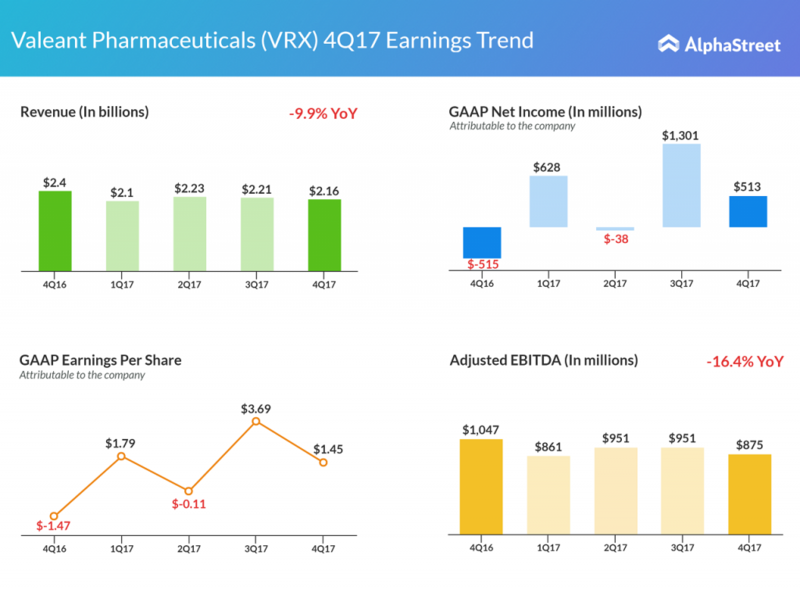 For the full year 2018, Valeant Pharmaceuticals expects revenues in the range of $8.10 billion to $8.30 billion, while full year adjusted EBITDA is expected in the range of $3.05 billion to $3.20 billion. Valeant will continue to address its debt, as well as reduce expenses as it has been doing since first quarter of 2016, said the CEO Joseph Papa.